1) Heat the Oil in a pan ,Pour the Egg without causing any damage to the Egg Yolk into the pan. 2) Wait for 4 to 5 mins till its almost done. 3) Sprinkle Pepper Powder and Salt to it. 1)Boil eggs, shell and keep it aside. 2)Heat oil in the pan. 3)Add onions, green chillies, ginger and garlic paste. 4)Fry onions till it turns yellowish brown. 5)Add tomatoes and fry it properly. 7) Slit the boiled eggs or make stripes with the knife and put them in the mixture. 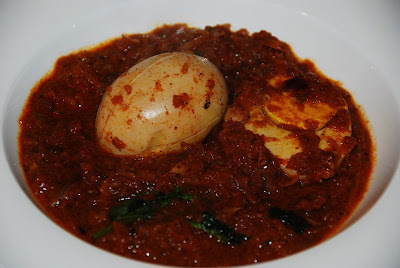 8)Cover the egg with the masala , cover the pan and let it cook for 15 mins. 9)Remove the cover of the pan. :- This Dish will go fine with appam, chappathi, etc.